For summer guests at a rustic New Hampshire resort, modern refrigerators have little appeal. Guests prefer cooling their beverages the old-fashioned way: with frozen lake water. Ice preparations begin five months ahead of time. The ritual dates to 1897, when Rockywold-Deephaven Camps first opened in the town of Holderness. Only a handful of other places in the country still harvest ice for commercial purposes. 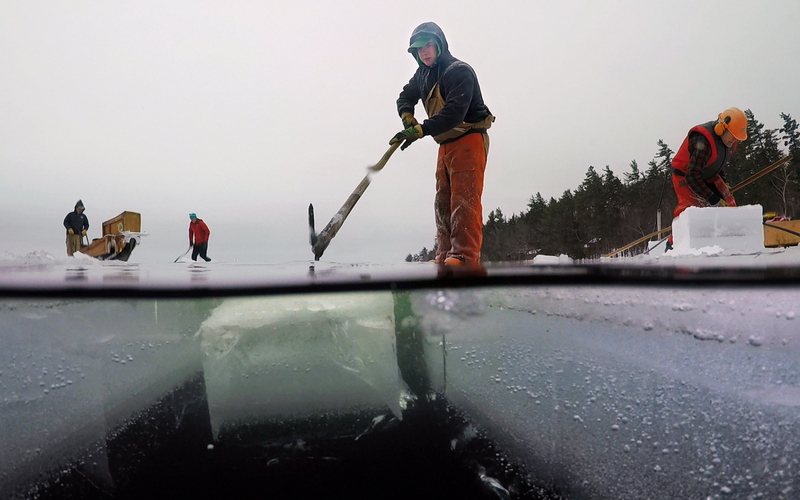 Resort staffers and volunteers gather in January to harvest ice from nearby Squam Lake. The group, equipped with chain saws, ice picks, and a huge saw on a sled, can harvest 200 tons of ice over several days in a typical winter. They transport the ice to two storage sheds on the campgrounds, where it’s kept until summer. Then, staffers with wheelbarrows deliver ice to resort guests, who place it in antique iceboxes to keep beverages and snacks cold. “Many of the families have been coming for generations, and people who come here don’t like to see much change,” says John Jurczynski, co-general manager of Rockywold-Deephaven Camps for the past 29 years. A push to bring in electric refrigerators in the 1960s was rejected by guests. Jurczynski oversees the ice harvest. By mid-January this year, the ice had reached a safe thickness—about 13 inches—and the harvest could begin. Workers cut as many as 3,600 16”-x-19” chunks weighing as much as 120 pounds each. They look like huge pieces of cake with powdery tops. How do you feel about traditions? Paul commends the Corinthians for remembering the Christian traditions he taught them. (1 Corinthians 11:2) What traditions does your family have that are important? That’s interesting, I guess I didn’t realize they still do that in New England like that. COOL!!! About the only tradition we have as a family is.... being loud!!! you are so right that the first thing I thought when I saw the pic! I live in NH, so this is especially exciting for me. I think that is really neat. I agree Meg M.! If any of you all would like to know what some other people think of frozen, go to the article " Can't Let Frozen Go" and see what you think! I think that's so cool to harvest ice!!!!!!!!! I wish I could do it almost. same that reminds me of frozen to. Look at what the people say in the comments. I didn't know they did that! That's like fifteen minutes from my house! Thats' great!